When I was in High School I was living in China. This meant that all kinds of cheap makeup was highly available around me. As someone who wasn't earning at all, I thought this would be the way to go! Unfortunately, most of them never lasted past a minute, and those that did gave me a panda eye halfway through the day. In the worst scenario, I even had ones that stung my eyes. The horror! Invest in good makeup (quality over quantity! ), even drugstore brands have good ones if you're on a budget! Don't go fiddling around with $2 makeup ever, I sincerely mean that. I used to use my mother's 5 year old foundation from Estee Lauder when I was in High School. Gross right? Back then, I never knew the evil consequences of using way expired makeup and thought that makeup was made to last forever! Terrible! Never ever think this way. From a poreless face, all kinds of pores popped up overnight and my skin got increasingly worse. Thinking back on it, I feel like crying now, but it's too late aye? Save yourselves!!! And remember that no matter how expensive your makeup is, the real price you're paying is with your skin! At one point of time, I thought that eye cream only made my undereye stickier, and thus made my concealer look cakier! Whattttt? As a youth I was full of rubbish. Anyway, after about 2 years of doing that, I realized my eye area was getting crazily dry and fine lines were popping up left right and center! What was happening was that I was basically growing years older than I actually was! Always always use eye cream, be it before makeup or before you go to bed. I cannot stress how vital it is. Thank goodness that my eyes were saved after I switched over to an amazing product by YSL, but remember that prevention is always better than cure! Start using eye cream at 18, and at 30 people will still mistake you for being in your early 20's! Do not perm your eyelashes in dodgy places at cheap prices. I've had friends complain about their pain before and here I will share mine. I went to a cheap shop in Guangzhou, and whilst the service only cost me about $10 (yikes right! ), what I really paid with is my self esteem - which did plummet through the ground. I was so sure I looked amazing.. but my then-boyfriend asked me why my eyelashes were sticking to my top lid like insect legs..... and I just lied and said I curled my eyelashes with the eyelash curler and he gave me this really puzzled "why would you do that!?" look. Anyway that was the end. I never permed my eyelashes again. 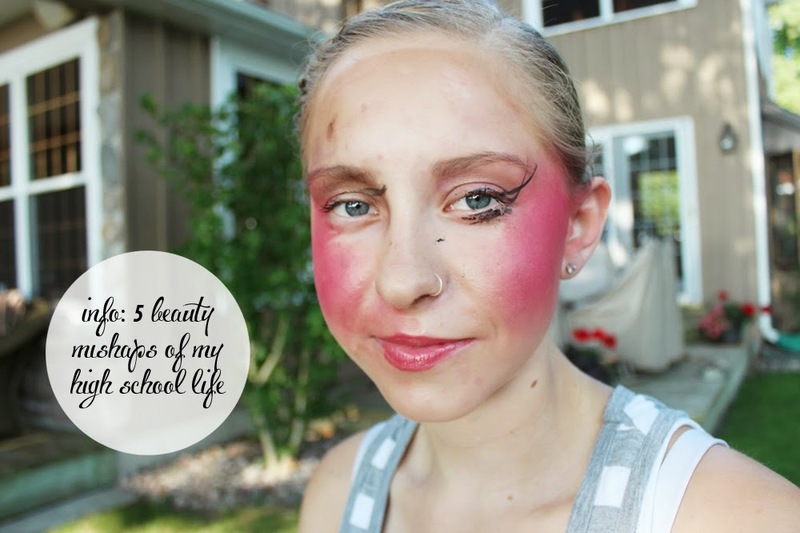 To me, makeup during high school was more about "putting on" than "taking off". It wasn't that I was lazy, but I was just very ill-informed. It didn't help that I was piling on makeup like nobody's business, and then failing to remove it all properly at night. When I look back on my bad skin days, I have nobody to blame but myself. Source out a good makeup remover - my personal favorite is Bioderma (light makeup), and Ashley's is 3CE's Cleansing Sherbet (for heavier makeup days). Also, no matter how good a makeup remover is, try your best to double cleanse. It's troublesome in the short run, but so worth it in the long run.